This is a guest post by my friend and instructor, Erik. Erik is now an airline pilot flying people in a part 121 operation and loving every minute of it. Here is his story about his start and his transition to the big leagues. Looking back on my high school days when I was thinking about what I wanted to do with my life, I never considered becoming an airline pilot. However, when I got to college to pursue a degree in engineering I started looking for something else to do with extra time. I joined a University run club that flew sailplanes on the weekend. That was the beginning for me. Everyone always remembers their first flight and mine was in something without an engine. In 2012 I took my first flight in an ASK-13 glider out of Ridge Soaring Gliderport in Julian, PA. Fast forward four and a half years and I am pushing back from the gate in a CRJ-900 for the first time wearing a shiny new pilot uniform with three stripes on my shoulder. The transition from glider to CRJ was not an easy one but this is how it happened for me. I accumulated the majority of my flight experience like most other pilots my age: flight instructing. Sitting in the right seat for primary and instrument students in addition to flying skydivers on the weekends at a local operation got me to 1500 hours pretty quickly. 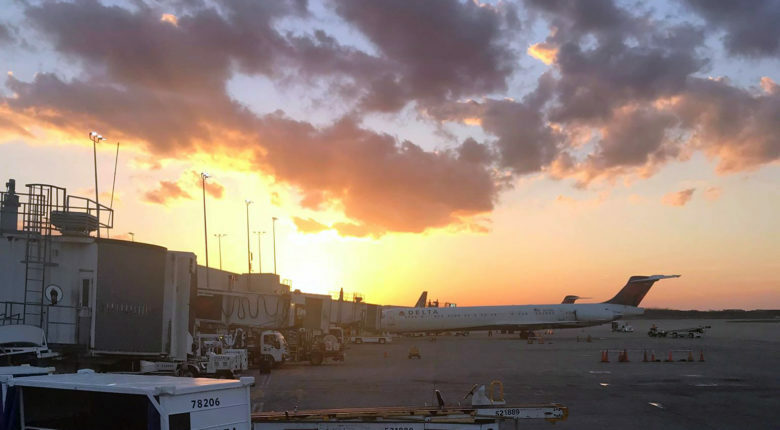 It may come as a surprise to many of you aspiring regional airline pilots that airlines will start interviewing you when you have around 800 hours. Interviews came and went pretty quickly and, frankly, were fairly easy. Interview questions consisted of topics like “tell me about a time where you learned a lesson from someone with more experience in aviation than you…”, and “what does being a professional pilot mean to you?” The technical portions of the interview consisted on of reading METARS and TAFS and advising if you would need a legal IFR alternate for a proposed flight. After going through several interviews and receiving job offers on the spot, I was still confused on which airline to accept a job with. My word of advice to everyone is to DO YOUR RESEARCH. As most of you know, regional airlines are desperate for pilots right now and the interview process becomes more of them trying to sell the company to you rather than the other way around. I had zero knowledge of how the airline industry worked, how pilots were paid, and how schedules were created. I spent a lot of time on the internet and on the phone with friends and family in the industry asking for advice on what to do. I finally accepted an offer with a Delta Connection carrier and was assigned JFK for my base. The next step was to pass ground school. The way my company orchestrated ground school was flying you out to company headquarters for 3 weeks of classroom sessions. We had weekends off and they even gave us flights home to see our families on the weekends which was nice. My cohort of new pilots were all assigned the CRJ-900 (opposed to the smaller CRJ-200) so ground school covered all the systems and limitations for that airframe. Moreover, we had to study all the part 121 flying FAA regulations as well as how to read the company paperwork that gets printed out by the gate agent before each flight. At the completion of each major milestone there was a 100-question closed book multiple choice test. These were actually quite challenging and you definitely needed to put in time outside of class to study for these. As you can imagine the systems exam is the most challenging. Thankfully I passed all those and from there it was on to the Flight Training Devices (FTDs). After about a week off to study for FTDs where we learned all the ‘flows’ and procedures required in the cockpit, we were sent back out to company headquarters to train in essentially a mock up of the cockpit. These were giant arrays of touch screens that looked like the inside of the flight deck where you can push switches and work the auto pilot panel in order to somewhat operate all the control systems on the aircraft. We ran through the standard callouts and memory items associated with each phase of flight. The biggest challenge was remembering everything. Yes we had checklists that we referenced but the checklist was just a way to ensure that we did not miss anything on the procedures we were supposed to memorize. At the end of this there is a ‘stage check’ of sorts where we are evaluated on our preparedness for simulator training. If any of these evaluations are not passed, luckily it does not get marked on our record as a “failure” but rather as an incomplete lesson. Finally, we were on to the most exciting part of training: the simulator. I did not have much to compare to, having never been in a full motion simulator in my life. However, looking back on it now, the simulator is EXACTLY like the real aircraft besides the landing characteristics (figuring out how to land the real aircraft proved a bit tricky after coming straight from the simulator). We were paired up with another first officer from our class for these lessons so things were a bit awkward when we sat left seat and had to fill in for captain duties. It was a good time to gain some perspective on what the captain expects the first officer to do. These lessons consisted of maneuvers training, and something we called line simulations. Maneuvers consisted of everything from low and high-altitude stalls, steep turns, terrain escape maneuvers, wind shear escape maneuvers, to single engine ILS and non-precision approaches. Because we did not have auto throttles and VNAV coupling capabilities, the non-precision approaches were by far the hardest. It brought a whole new meaning to staying ahead of the airplane as you needed to be two steps ahead mentally of each step-down fix on the approach. The line simulation lessons were the most fun because we flew the simulator like it was a real revenue flight including flight attendant briefings, pretending to make passenger announcements and so on. I felt pretty silly at first making passenger announcements but I am glad I got to do it for practice before the real thing! These lessons included a flight from point A to B where some sort of mechanic malfunction happened and you and your sim partner would have to work the problem, run the checklist, talk to dispatch, and come up with a game plan. It was challenging because it required the type of leadership only a captain with part 121 flying experience would be able to provide. Yet, it showed us exactly how diversions and emergencies happened in the real world. Three months after my start date I was signed off for my check ride. The training program I was in didn’t do check rides like I was used to in the General Aviation world. I was used to 2-hour oral exams followed by flying some maneuvers, landings, stalls and simulated emergencies. Much to my surprise, the oral exam was only about 15 minutes long. The examiner took aircraft systems questions out of a question bank and as long as you get 80% of those correct, then you head on into the simulator again for the flight portion of the exam. The examiner handed me a dispatch release and flight plan as the gate agent on a real flight would do. They paired me up with a real captain whom I had never met before. However, I was the only one being examined and the captain was just there to ride seat support. Our first leg in the simulator consisted of a hydraulic failure after departure where we had to divert to an alternate airport. On the second leg, climbing through 1000 feet AGL we received a left engine fire and had to circle back around to the airport for a single engine ILS approach. We made some mistakes along the way as anyone would but the important part was that we did not let the aircraft enter an un-desired state. In the part 121 world they place a lot of attention on threat and error management and that means we as pilots need to catch errors before they become serious. That was it! Two legs with a failure along the way and the check ride was over! I was now an Airline Transport Pilot. The examiner handed me my temporary certificate and I could not have been more relieved. However, training wasn’t quite over yet. The final portion of training consisted of what is called Operational Experience. I flew with a Line Check Airman (basically an airline Certified Flight Instructor) for the first 30 hours so he could make sure I was good to go. I flew real revenue flights with passengers which was (and still is) the most intimidating thing in the world for me since the biggest thing I flew before this was a Piper Seneca. Yet, the training program at these airlines does a fantastic job preparing a new pilot and I felt well prepared and ready to go. I remember the first time I soloed in March 2012 in a Piper Tomahawk and what that felt like. 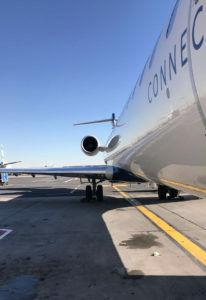 Nothing has come close to that feeling of freedom until I pulled the yoke back on a CRJ after the captain said “Rotate.” We blasted off from runway 31 at LaGuardia climbing 4000 feet per minute with the beautiful New York City skyline in the background. I was so task saturated that I didn’t have much time to enjoy the moment but knew that I had finally made it to the cockpit of a jet. There was no other word for it; it was awesome. I have been on reserve for 3 months in New York now with just around 100 hours under my belt in the CRJ and I am having an absolute blast. The training program I was put through did an excellent job preparing me to be a safe line pilot but as the saying goes, the learning never stops. There are always times I have to look something up in the manual or reference the regulations just to make sure I understand everything correctly. I hope this story makes the path a little clearer for those of you aspiring to come to the airlines as well. The transition from flying single and multi-engine pistons definitely is not easy but definitely possible with hard work and focus. Being in this industry you will hear a bunch of complaints about everything but as long as you keep your nose clean and work hard the rewards are unbelievable! As far as I am concerned I have the best job in the world.